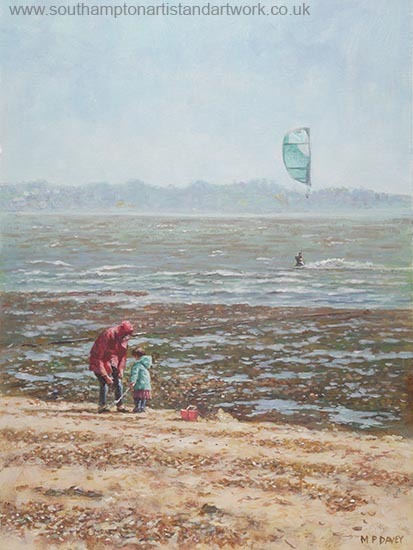 This painting features a windy winters day on the beach at Lepe, Hampshire on the South coast of England. A mother and her daughter are on the beach well protected from the cold wind but the girl has apparently given up on building a sandcastle. In the distance can be seen a water skier using a kite to propel themselves on the choppy water on the Solent, with the Isle of Wight in the far background. This acrylic painting was started during mid December 2016 and finished mid January the following year. The painting time was short but slow progress was made because of Christmas and the fact that the studio space was quite cold.